My Facebook feed is full of photos of shipshape garages, orderly closets and neatly stacked undies. Marie Kondo, an organizing consultant, encourages people to sort their belongings. And, if an object does not spark joy, toss it. Some of my belongings don’t spark joy, yet I’d be loath to part with them. When I started de-cluttering my house, a chair, a magnifying glass and a hammer did not make the Kondo cut. wearing it like a hat. 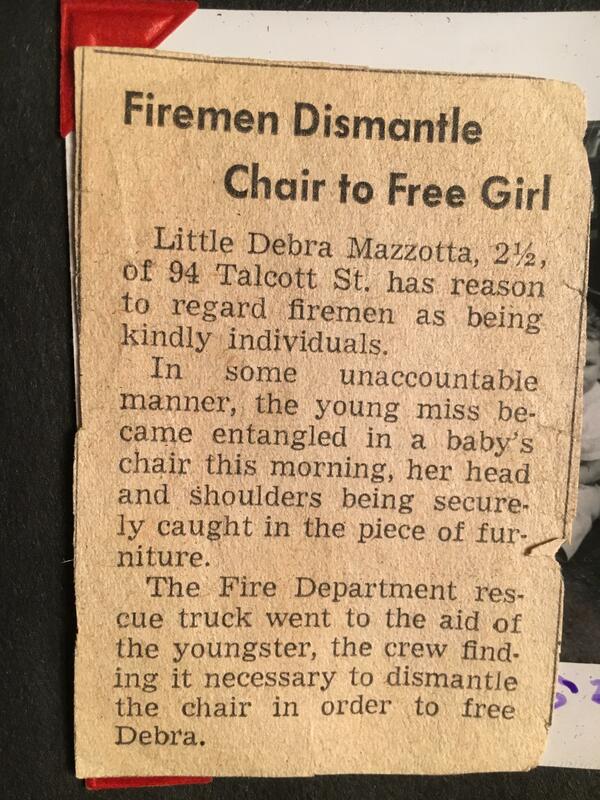 My mother couldn’t disentangle me, so she called the fire department. A truck arrived with sirens blaring. Enormous men tramped into our tiny kitchen. 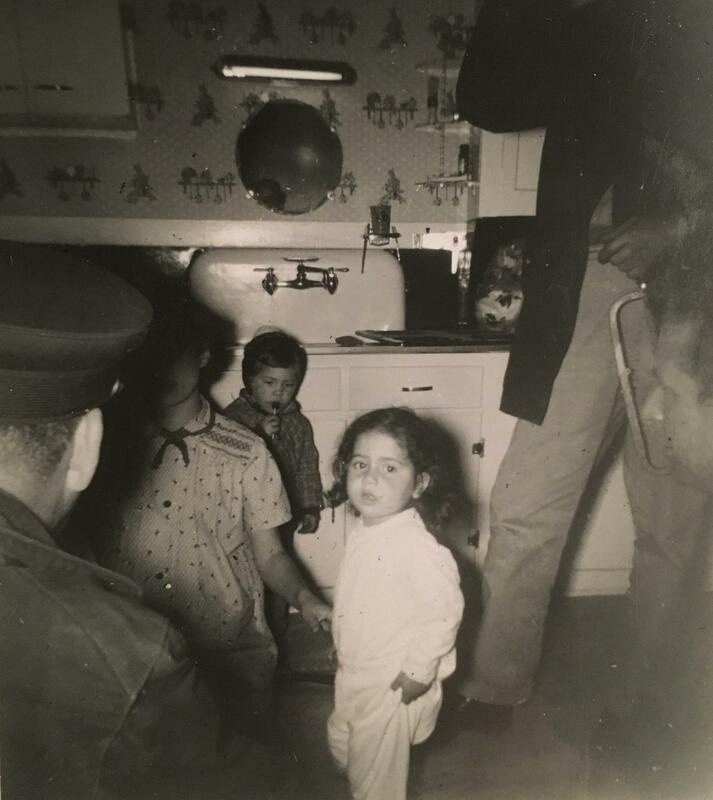 One approached me with a saw in hand, causing terror to ripple through my two-year-old soul. Why do I keep the chair? It reminds me of why my default reaction is fear when I’m in a tight space, why I always choose an aisle seat, why I won’t enter a crowded elevator. I’m not as hard on myself because the chair helps me understand how I’m wired. On my bureau is a small, circular magnifying glass encased in a leather sleeve. Our neighbors heated with coal that arrived via a chute through their basement window. Chunks of coal bounced off of the chute onto the ground, landing under rose bushes. We kids pretended we were pirates and the coal was pieces of eight. We’d yell, “Yo Ho Ho,” then dive into the bushes, fighting over the treasure. Raw greed exceeded caution. I’d often wind up with a thorn in my finger. My father used the magnifying glass to spot the foreign body and then a needle to coax it out. Do I like being reminded of those thorns? No. However, I do treasure the poignant memory of a childhood long gone. I loved being part of a raucous pirate band, wild and free, sailing over an asphalt sea, fully convinced that only wonderful adventures lay ahead. The magnifying glass brings back memories of a childhood filled with dreams. I am sad about the unrealized dreams. But, I remain cautiously hopeful. There is still time. I’m not dead yet. On the poetry ledge of my bookshelf leans a slender, pointy hammer with a magnetic head. My father was an upholsterer. When attaching fabric to the edge of a sofa or chair, he’d fill his cheek with little black tacks. Then he’d use the magnet end of the hammer to grab the tacks and pound them along the border. When I visited his shop, I’d never start a conversation, worrying he’d swallow the tacks. Although we didn’t talk, I got to watch my dad create furniture out of wood, burlap, stuffing and fabric. My house is filled with pieces my father has made. He’s been gone almost a year now. When I glance at that hammer and the furniture, I feel sad, but also grateful that I had an opportunity to observe a life well lived. After reading Kondo’s book, I’ve made many trips to Good Will. I’ve simplified my life and am happier for it. However, I don’t regret keeping those three items even though they spark a little sadness in me. Kahlil Gibran says that sorrow and joy are inseparable. If he’s right, “tossing” sadness may result in losing joy. As for me and my house, we will stay cluttered.